Most of my life, I’ve lived on or near a beach on the Texas Gulf coast. When I was two, I learned to swim in the Gulf of Mexico and eventually embraced the surfer lifestyle. I learned to watch the waves and understand the weather conditions that made them surfable. The beach always granted me so much serenity. The ebb and flow of the frothy waves soothed my soul. As each set swept back out to sea, my worries washed away as well. Sitting on a board or laying in the sand enjoying the warm sun wash over me, I would feel that nothing was impossible. I never took this lifestyle for granted. And I sure do miss it. Besides missing that lifestyle, that environment, I miss that feeling. Maybe I need to go sit on a board off the third sand bar at sunrise waiting for a glassy set to come in? 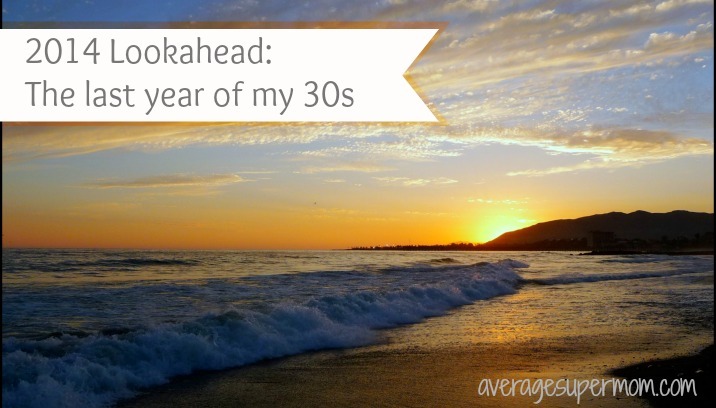 I know one thing for sure, as I navigate this last year of my 30s, finding that feeling is at the top of my list. But that’s not all that’s on my list. I don’t typically make New Year’s resolutions – that’s something I reserve for my birthday because it seems more appropriate to me. Maybe I’m caught up in the hype or the buzz this year because I’ve got a list of goals for 2014. I’d like to make a few changes and and evolve this year in a lot of ways. Run a 10k – I’ve been training for it for the past two months and I’m really looking forward to this goal. I’ve not done a physical challenge like this since I rode my bike 150+ miles from Houston to Austin in 2005. Drop this extra 20 pounds – I think the running will help with that. Work on my mental health – Maybe mediation? Maybe more writing? Cultivating those new friendships? Or all of these things? I think my mental health needs to be front and center this year. Decorate – An undecorated, cluttered space stresses me out. We’ve been in this house for almost three years now and not a single room is finished. 2014 will be the year of decorating our McMansion. And you will all get to come along for the ride. Work – I need to clarify my career goals. With 40 approaching at such a rapid pace, it’s time to decide what makes sense for me in my work. Do I write more? Should I finally get my real estate license? Do I need to focus more on my day job? Retirement – We’ve been saving diligently since we got out of the Air Force 15 years ago, but we have not decided what we are saving for. It’s time to think about finding that little bungalow near a white sand beach with clean glassy waves. Or something. Baby? – yeah, you read that right. We will see what 2014 brings. So there you have it. Kind of like goals. Sort of like resolutions. Mostly like a rambling semi-organized list of things I want to evolve this year. I can’t wait to get started. What are your goals for 2014? Do you need a new evolution? I’d love to hear about it. I love the bullet that says Baby? How exciting (possibly). Thanks Jocelyn! It’s going to be a huge year for you! I’m so excited for all this year will bring you. I am with you on my final year in my 30’s, and also am not a big fan of New years resolutions – I just manage my goals year round1 With that said, I am also taking a look at where do I go with work, life and health. My big focus is going to be on making work work! 🙂 good luck with your list! Thanks Andrea! Best of luck with your goals, too!